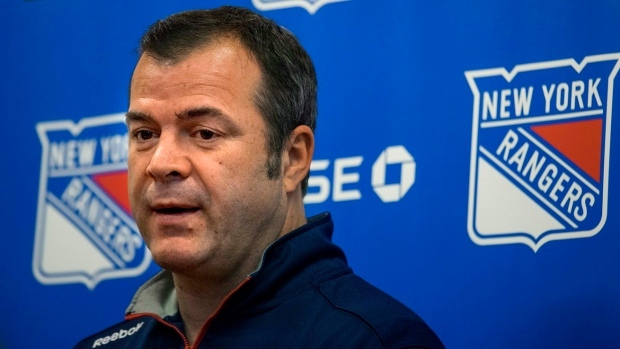 CALGARY — Alain Vigneault will coach Team Canada at the world men's hockey championship next month in Slovakia. Vigneault's assistants will be former Philadelphia Flyers head coach Dave Hakstol, Canadiens associate coach Kirk Muller and Rangers assistant coach Lindy Ruff. "We are extremely fortunate to once again bring together four elite-level coaches with over 60 combined years of NHL coaching experience to lead Team Canada in Slovakia," Hockey Canada CEO Tom Renney said in a statement. "It is always exciting to represent Canada and compete for a gold medal on the world stage, and we believe this group will use their professional and international experience to provide outstanding leadership to this year’s team."